U.S. equities put together a good bounce on Thursday, shaking off some of its losses from Wednesday. Of course, some of the bigger moves caught our eye for our top stock trades. Broadcom Inc (NASDAQ:AVGO) shares plunged on Thursday, falling more than 17% at one point. That follows an almost-3% loss on Wednesday and comes after the company confirmed it would acquire CA, Inc. (NASDAQ:CA) for almost $19 billion. So what now? 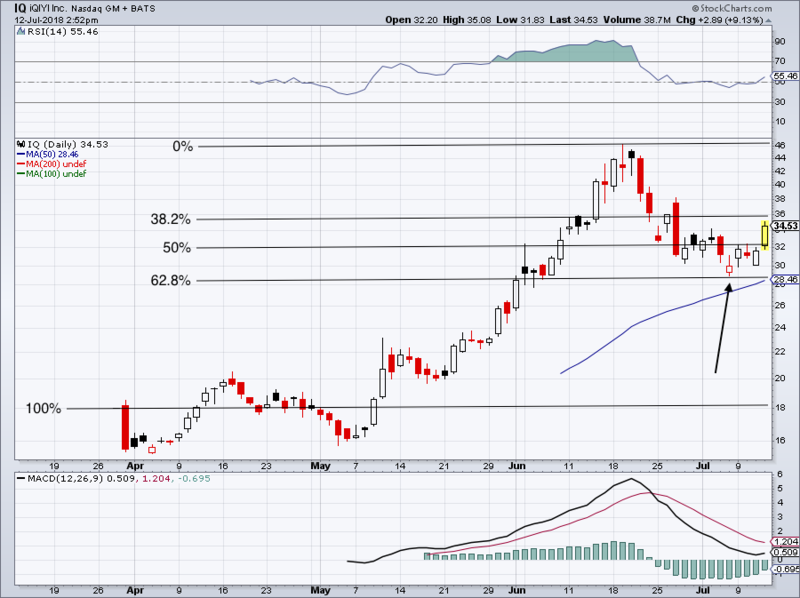 Shares basically cratered through all sorts of support levels, the largest being $220. If I were short, I wouldn’t stay that way if shares get back above this mark. The next “big” level of support sits all the way down at $170, although given Broadcom’s business, I wouldn’t expect it to fall that far. I think we need to let AVGO shake out a bit before the technicals point us in a specific direction. Over $200 is a start. This is one that InvestorPlace readers should have nailed, given that we laid out the game-plan for iQiyi, Inc (NASDAQ:IQ) a while ago. “The Netflix (NASDAQ:NFLX) of China” is one we want to own. That’s why we were buyers into the upper $20s, where Fibonacci support was likely to come into play. Admittedly though, I would have loved for a shot a bit lower at the 50-day moving average. Not only was the 68.2% Fib bounce in the cards, but this was a previous consolidation zone for IQ, which is up almost 10% Thursday. So where to now? This $35.50 to $36 area could give IQ some trouble, but should it clear it, the $46 highs are technically back on the table. Market sentiment and investor psychology will drive IQ. While the news about Papa John’s Int’l, Inc. (NASDAQ:PZZA) and its founder is pathetic, the business will likely be fine over time. But we’re not here for a fundamental snapshot, we’re looking at the stock price. Right now, PZZA’s stock looks nauseating. $50 looks like it could be a bottoming area for PZZA, but bulls shouldn’t think about buying this name until it gets over resistance. While above the 50-day right now, the 200-day and 100-day moving averages still loom over PZZA. 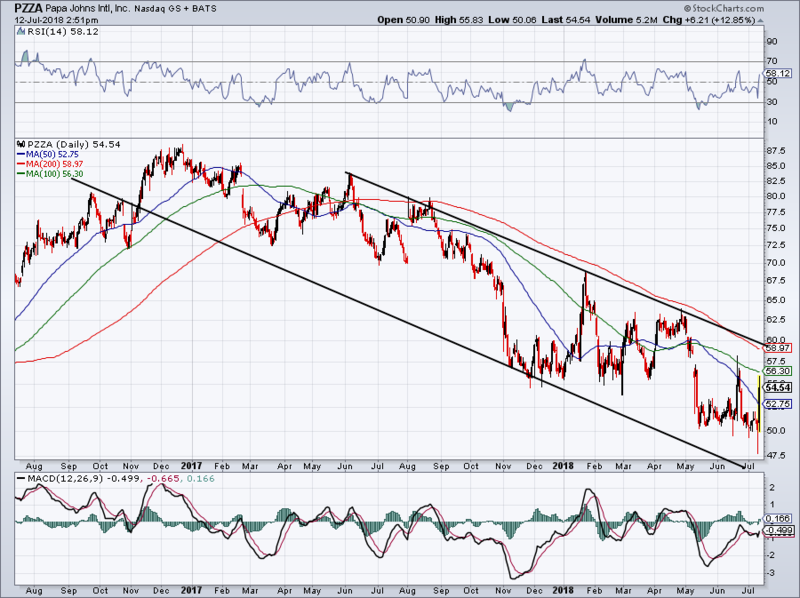 There’s also tough downtrend resistance overhead near $59. In trading, the keep-it-simple (KISS) method tends to work best. Applied Optoelectronics (NASDAQ:AAOI) fits that mold. Is $50 not the most obvious level in the world here? 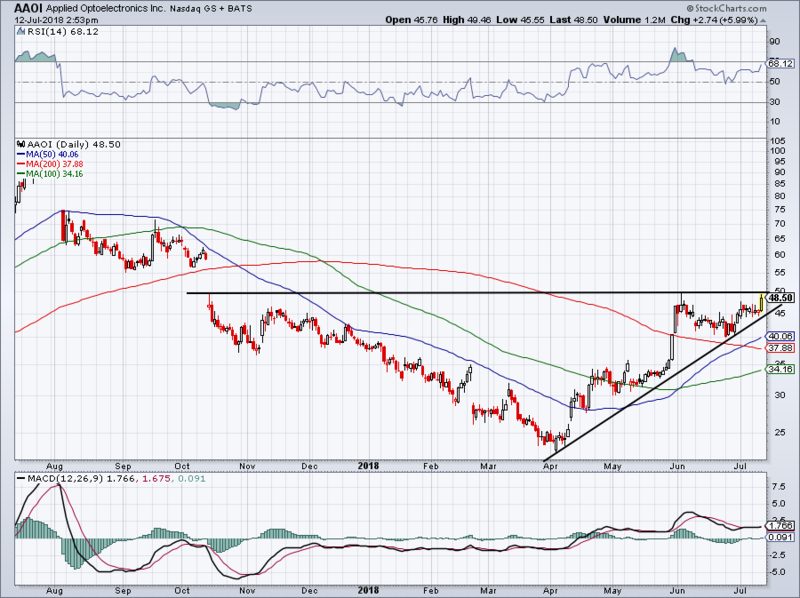 Shares continues to trend higher and a breakout over $50 appears imminent. Bulls can buy on a close over $50 and use a stop loss below trend-line support. Additionally, should AAOI pullback before breaking out, bulls can buy near trend-line support for solid risk/reward setup. One more KISS setup? 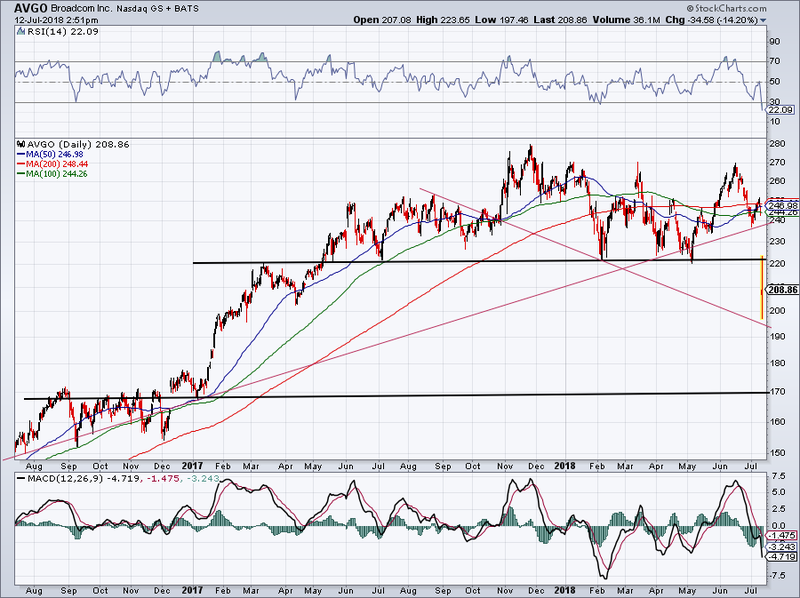 Adobe Systems Incorporated (NASDAQ:ADBE). Repeat after me: We. Buy. Secular. Winners. On. The. Dips. Be it a name like Adobe, Salesforce.com, inc. (NASDAQ:CRM) or any other stock that just keeps on winning, we don’t bet the house looking for a loss. It might pullback during market tantrums or like in Adobe’s latest case, on quarterly earnings even though the results were great. Just look at that 50-day moving average, a constant buoy for a higher stock price. If investors buy those corrections enough times, they don’t have to worry about the time it eventually fails to hold, given how large their gains will be. And assuming they use some discipline. Now ADBE is knocking on $255’s door. Should this level give way — which was resistance last month — the all-time highs near $260 are back on the table. Shares aren’t overbought according to the RSI (red circle) and momentum just shifted into the bulls’ favor (blue circle). 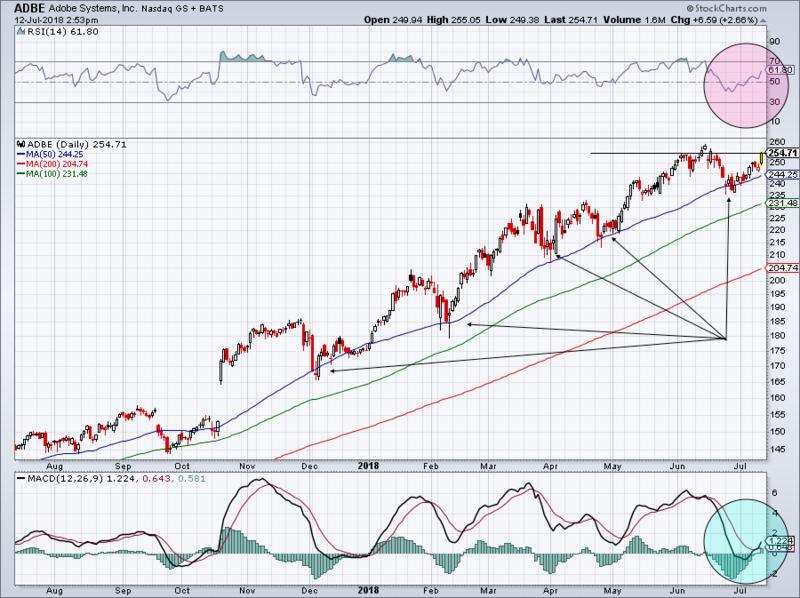 It’s hard to be bearish on ADBE right now. Bret Kenwell is the manager and author of Future Blue Chips and is on Twitter @BretKenwell. As of this writing, Bret Kenwell was long CRM and ADBE. Article printed from InvestorPlace Media, https://investorplace.com/2018/07/5-top-stock-trades-for-friday-iq-aaoi-ca-avgo-adbe-pzza/.